The Department of Mechanical Engineering at the University of Arkansas is proud to have sponsored a National Science Foundation Supported REU program for over 10 years. NOTE: Please note that information provided in the application may be used to report statistics to the National Science Foundation or other reporting agencies in an aggregate report. All information provided will remain confidential. *Dependent upon 2019 funding confirmation. Fayetteville ranks fifth on the U.S. News & World Report 2018 Best Places to Live list. 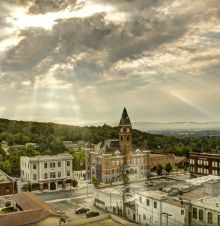 Fayetteville is the third-largest city in Arkansas. The city has been the home of the University of Arkansas since the institution's founding in 1871. Fayetteville is on the outskirts of the Boston Mountains, deep within the Ozarks. Best College Reviews rated the University of Arkansas Student Union as one of "The 25 Most Amazing Campus Student Unions"-Best College Reviews. The Carnegie Foundation classifies the University of Arkansas as having “very high research activity,” a formal classification that places us among only 3 percent of the nation's top universities and colleges. The University of Arkansas is the only comprehensive PhD granting university in the state of Arkansas. The College of Engineering is made up of over 3,500 students (undergraduate, masters, and doctoral) with over 100 instructional faculty. The College of Engineering reported $29.8 million in research expenditures for 2017. Faculties at the College of Engineering are conducting research in many key areas, including alternative energy, nanotechnology, information security, biomedicine, transportation and logistics. Eight degree programs are offered, including: Biological and Agricultural, Biomedical, Chemical, Civil, Computer Science & Computer Engineering, Electrical, Industrial, and Mechanical. Strong graduate program with many successful alumni. Record of industrial support (Caterpillar, INfoSciTex, Cameron International, etc.). Government-sponsored fundamental research (NSF, ADHE, ABI, Office of Naval Research, AR Space Grant Consortium, etc.). From some of the best universities in the U.S. The Mechanical Engineering department is the only department within the College of Engineering that has a dedicated building. The Mechanical Engineering building houses four classrooms, teaching labs, two computer labs, and graduate student offices. The majority of the department faculty and staff are located in this building as well. HiDEC facilities include nearly 6,000 square feet of clean room space which houses conventional MCM processing on five-inch wafers, deposition and photolithographic definition of thin film materials, and package assembly. With a state-of-the-art facility and a novel approach to graduate education, the Nano building helps the University of Arkansas satisfy the needs of the nanotechnology industry for the foreseeable future. Faculty work with students to conduct research that makes a difference in the world. Topics of research in the centers include the improvement of health care efficiency, security of roads and waterways, advance electronics packaging, and even cancer diagnosis and treatments. 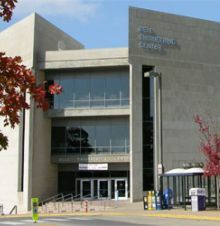 The Arkansas High Performance Computing Center is a University-supported facility which provides high-performance computing resources and support for research and educational activities. The AHPCC staff currently manage nearly 5,000 computing cores with different memory and physical architectures to support a wide range of different types of computational research in both computer science and in the domain sciences.